A chapel of this name is mentioned in Olomouc in 1453. It was in the churchyard at St Moritz Church, and was called Czech or Moravian Chapel because on Sundays and on feast days a sermon in Czech was preached there (services at St Moritz s were in German). After a fire in 1709, the chapel was desecrated and in 12812 demolished. 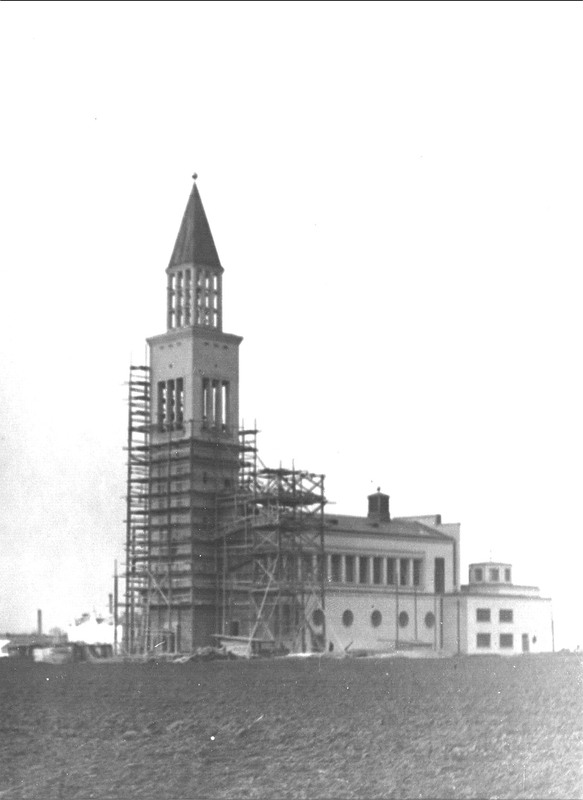 When in 1926 Pope “Pius XI expressed his wish that churches should be built on the periphery of large cities, the Archbishop of Olomouc and Metropolitan of Moravia, ThDr. Leopold Prečan, had a church built at Hejčín, a suburb of Olomouc. 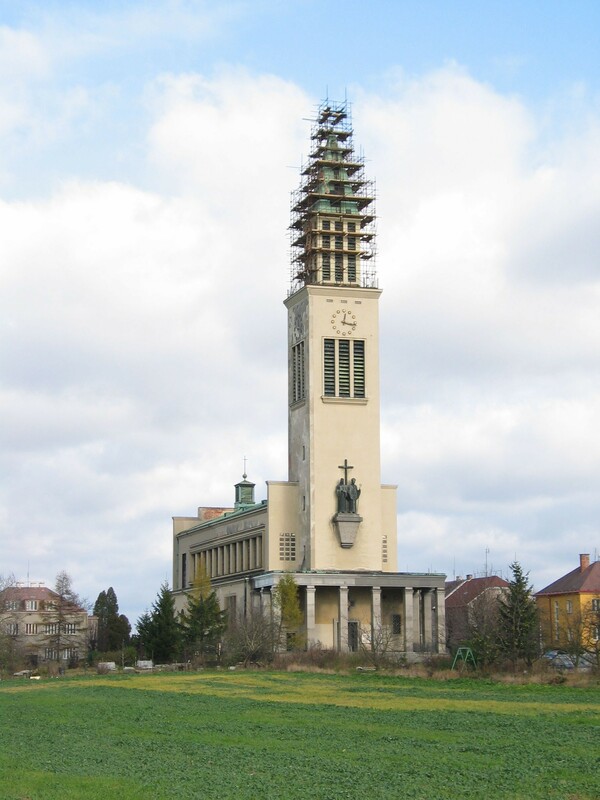 In 1927 a celebration in memory of the 1100th anniversary of the birth of St. Cyril was held at Velehrad, and there Archbishop Prečan decided to consecrate the new church to the two apostles and patrons of Moravia. He explained that he saw the new church as a replacement of the ancient chapel of Sts Cyril and Methodius, which existed in Olomouc in the 15th century and possibly much earlier. St Cyril (Constantine – 827) and St Methodius (815) were born in Thesalonica (in those days in the Byzantine Empire), their father was a high military official. They had five brothers and sisters and obtained good formal education. Constantine – surnamed the Philosopher – served as a librarian at the Church of Holy Wisdom in Cařihrad. Methodius, a lawyer, was a state official in the region of Baltic Slavs. The brothers prepared themselves very well. Constantine invented the Slavonic alphabet (glagolica), suitable for the phonetic system of the Old Slavonic language, and then started translating the Holy Scriptures and liturgical texts into it. Methodius prepared legal writings – ecclesiastical and secular laws – taking into consideration the Byzantine and Frankish laws. The two men arrived in Moravia, a region of Latin missions, as simple missionaries, baptized the people and its leaders, taught their disciples. They were summoned to Rome for employing the Slavonic tongue in the church services. After an understanding had been arrived at with the Pope, Cyril remained at Rome (he died there in 869), but Methodius returned to Moravia as archbishop of the church there. He became involved in quarrels with the German clergy, in consequence of which he was again summoned to Rome in 879 and 881. After the latter date nothing is heard of him until his death in April 885. His grave at Velehrad has not been found yet. Their activities were important for all Slavs because the script they designed made Old Church Slavonic a standard language. The Holy Scriptures and liturgy thus could reach other Slavonic nations. They helped to spread Christianity and contributed to the spiritual, cultural, political and material elevation of the Slavs. He devoted all his life to God and the people of Moravia. Like the Moravian missionaries of the 9th century, he promoted Christian faith and education in the country. Although he was a modest and kind man, with a sense of justice, he faced much misunderstanding and opposition. Still, he was always able to forgive and forget the wrong-doing. He was born on March 1866 in the family of miller at Velký Týnec (the Haná region). There were five children. He was an excellent student both at the Slavonic Gymnasium and at the Faculty of Theology in Olomouc. He was consecrated to priesthood on 5 July 1889, the feast day of St Cyril and Methodius, at St Wenceslas Church. For five years he served as priest in difficult conditions, in remote village parishes. In 1894 this talented young priest was appointed deputy professor and lector of the seminar, and at the same time he was to study for the doctorate. In 1897 he became an official of the Consistory, and although very busy in the administration, he finished his doctoral studies and graduated with a ThDr. degree. For the next twenty years he taught ecclesiastical law at the Faculty of Theology, while continuing in his job at the Consistory. Knowing him as a kind, hardworking and conscientious official, Archbishop Antonín Cyril Stojan in 1923 chose him as the General Vicar. When in the same year Stojan died, Prečan became Archbishop (on 30 December 1923). He asked the believers to pray for him so that the Good Lord may preserve his faith, his hope, and deep love, so that he could be a good shepherd. 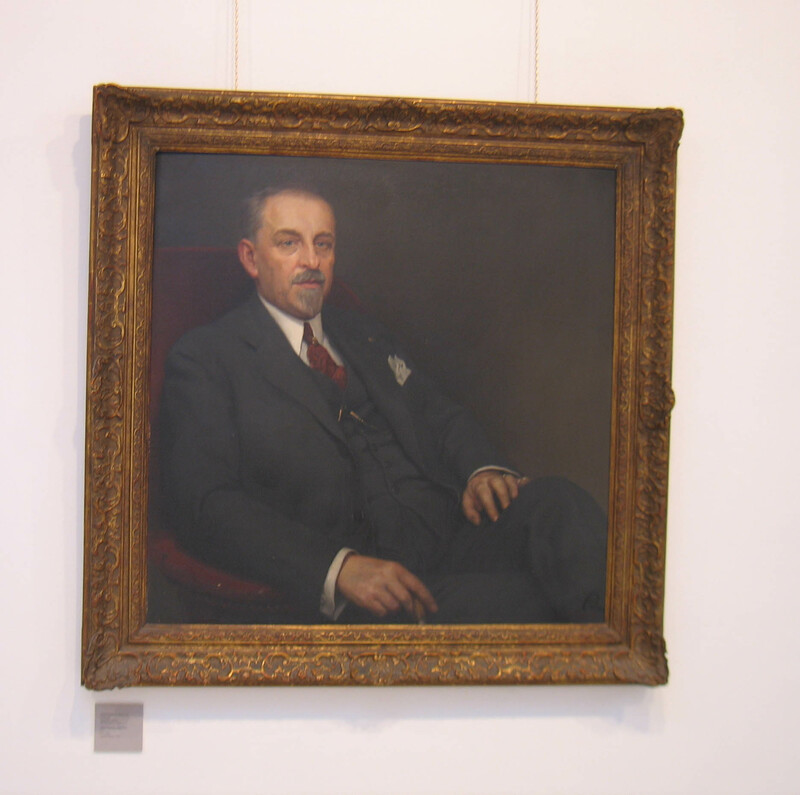 Stojan is most remembered for his work of charity. Prečan gave as much as he found possible and repaid some debts from the previous period. He himself established several charitable foundations, for students, old people, and sick clergymen. Stojan became known all over Europe for his efforts at unification of the Slavs in faith. The idea even crossed the ocean. From 197 he organized international unionist congresses at Velehrad. Archbishop Prečan continued in this work, organizing unionist congresses in 1923, 1927, 1932. In late 1929 in the journal Apoštolát he published a protest against the anti-religious campaign then culminating in Bolshevik Russia. 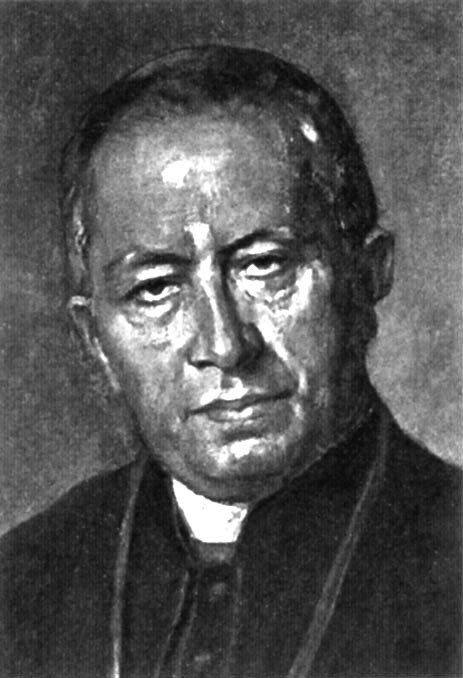 The article inspired protest movement in Europe and was supported by Pope Pius XI. Prečan’s articles, translated into Russian, were read by the Orthodox believers, who felt encouraged by his protest against the cruelty of the Soviet government. Archbishop Stojan turned his main attention the country people, to villages with no churches. There he founded “church societies” and helped with the construction of thirty new churches. He also paid attention to industrial centres and urban periphery, where poverty is often combined with moral misery. 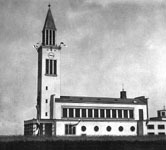 So churches were built at Svinov and Moravská Ostrava, and a factory church, which was to be demolished, was purchased and restored (St. Barbara’s at Štěpánov). A parish house was built at Olomouc-Hodolany. The monumental marble hall with a mosaic and chimes was his expression of reverence for the Slavonic missionaries. His library contained many books on art and architecture and he devoted a great attention and gave much care to the building of the new church. From 40 projects he chose the one by architect Josef Šálek from Brno. The church he loved so much, later became the place of the Archbishop‘s last rest. When he died on March 2, 1947, he was buried in its crypt. 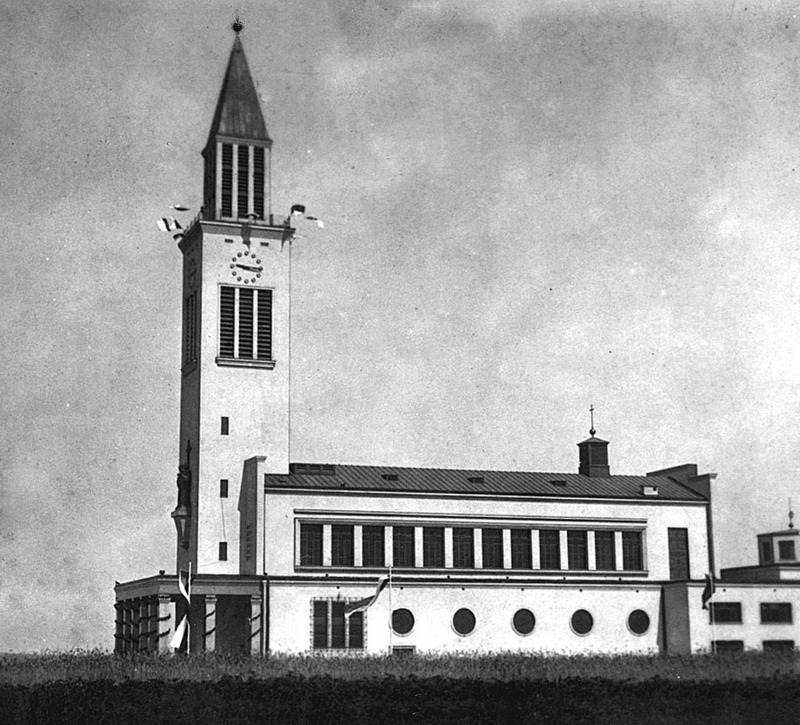 Designed in 1929-1932 by Architect Josef Šálek, built by Jindřich Kylián and Tomáš Šipka. Sculptural decoration by Julius Pelikán, paintings, mosaic and stained glass by Jano Köhler, applied art work by Franta Anýž. Urbanistic solution by Architect Ladislav Skřivánek. 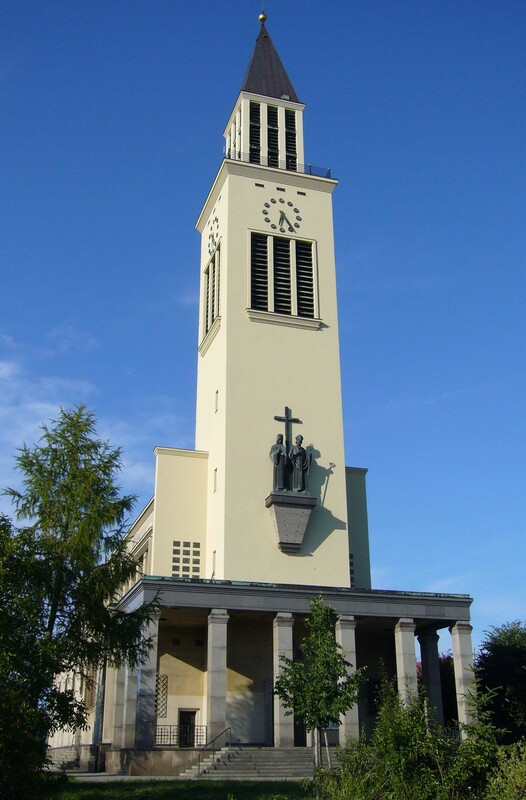 The church became a landmark in the new garden district and contributes to the western panorama of the town. The church is a basilica with a nave and two aisles, the front tower is 65 m tall. At its top is a cross (5m) with a bulb (diameter 80cm). 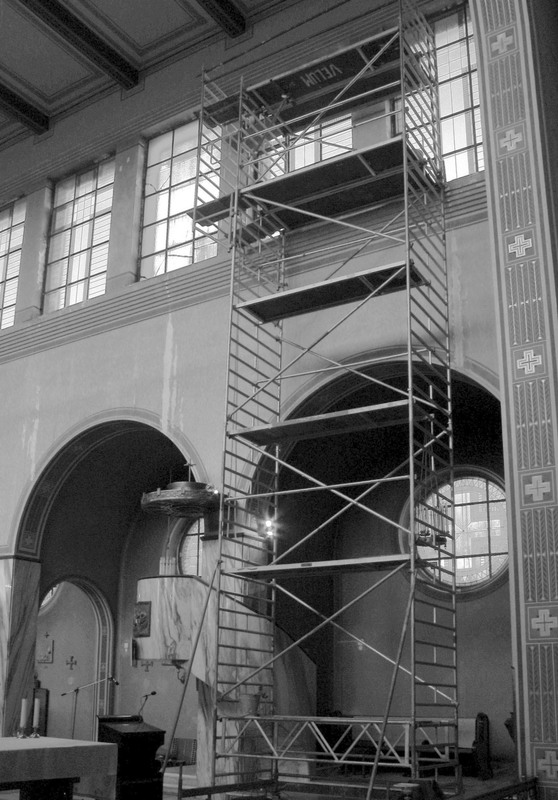 Under the observation gallery is the tower clock, with dials facing all four points of the compass. 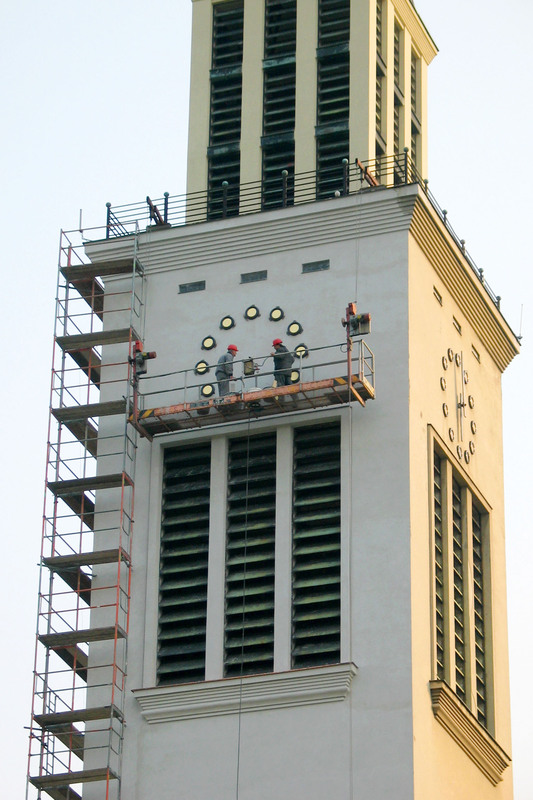 The nine bells played five tunes of the chimes but in 1942 the bells were confiscated by the German occupation forces. Only in 1994 three new bells were hung up but the chimes could not be restored yet. 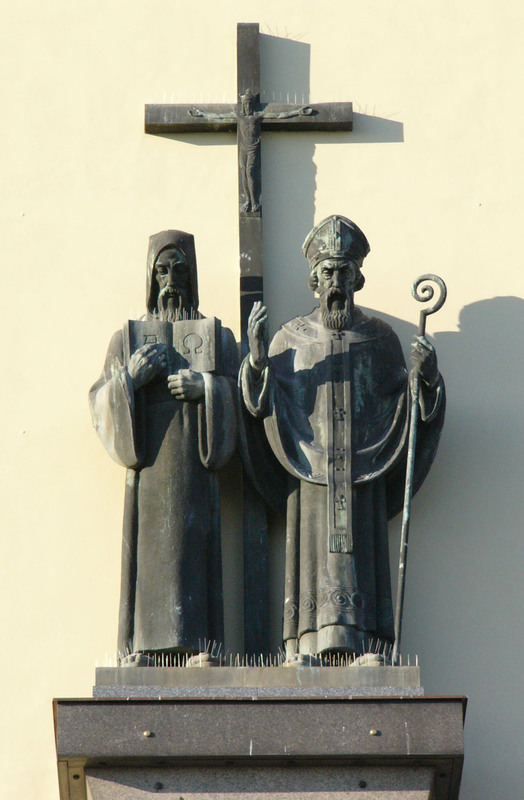 Above the front of the church are situated the bronze statues of St Cyril and St Methodius (4.25m). The entrance way consists of a staircase leading to a platform in the shape of a portico of ten massive square-shaped granite pillars. The interior is based on the contrast of vertical and horizontal lines. A powerful bronze door leads to the antechamber with marble facing. A glass door in a brass frame separates the antechamber from the nave. The interior is light and airy, the walls and the stained glass are in subtle colours that inspire a feeling of calm, harmony and concentration. Though the arch of triumph one enters the presbytery, terminated with a gigantic frontal mosaic, with numerous figures. The design of the tabernacle is untraditional, with a dome. The pillars separating the nave from the aisles have marble facing. The dimensions of the nave are 33.90m by 12.60m, the ceiling is 14.50m high. The aisles are 2.65m deep and 7m high. 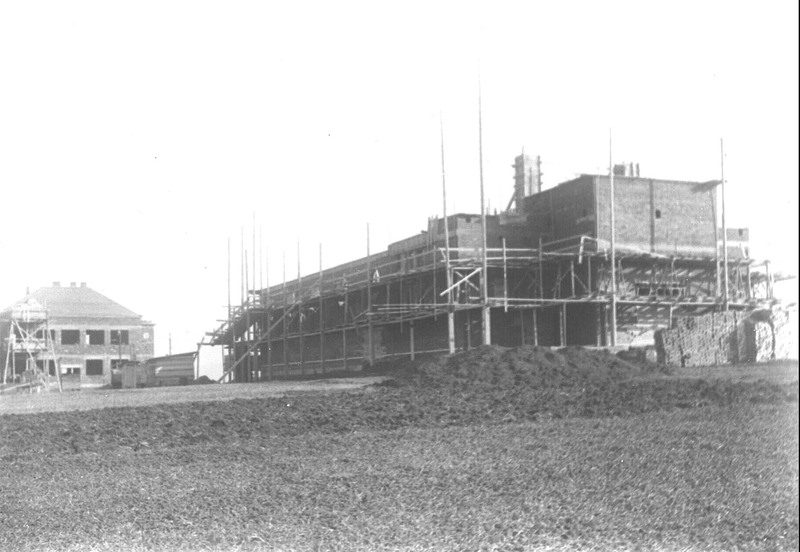 The presbytery is 12.60 x 6.40, height 14.30m. The interior decoration is austere and is designed to attract by the material used, with marble of 22 varieties predominating. The pews and confessionals are in the style of the building. Lighting is done by brass chandeliers, placed both on the walls and the altar. 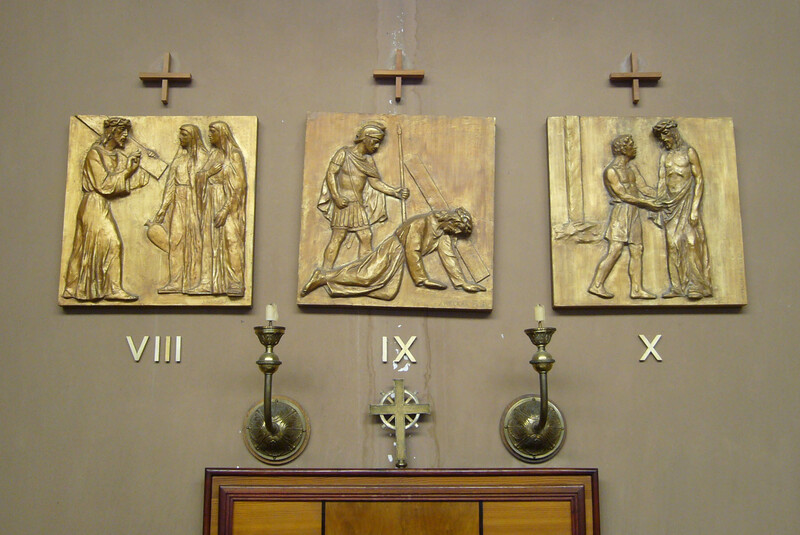 In 1998 the Stations of the Cross, by an Olomouc sculptor, Jan Neckař, were added to the church. Patinated plaster reliefs bear, on the bottom side, the names of the donors. The triumphal arch separating the presbytery from the nave has facing of Pyrenean marble Rogue Antique. The mosaic on the back wall is framed with yellow-brown Belgian marble. The facing for the side walls is from yellow Slovak marble. The size of the mosaic is 8,70 x 7.20 – nearly 63 square metres. 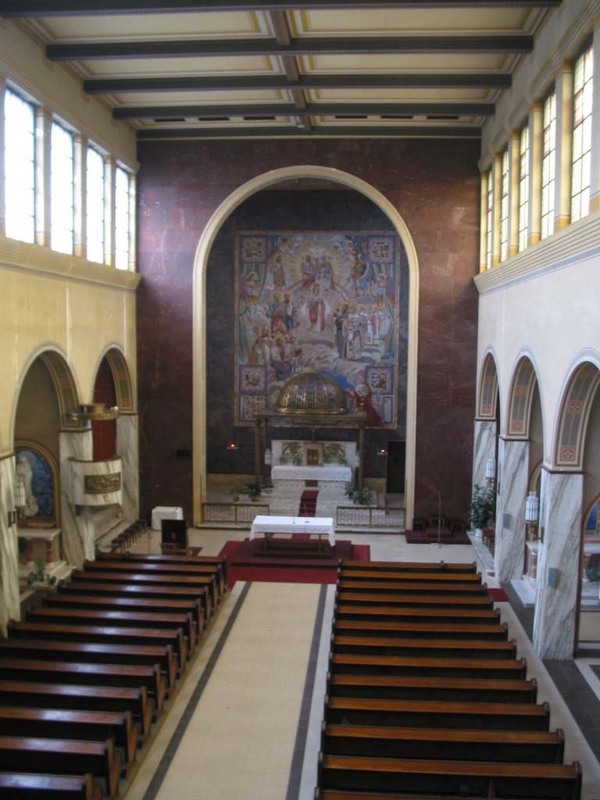 It was designed by Jano Köhler and produced by four Italian mosaic workers. The subject itself was provided by the Archbishop: At the top is the Holy Trinity, in the upper middle the Virgin Mary, at the upper right the Archangel St Michael with a shield, at the upper left St John the Baptist. The images follow the text of the opening prayer with which the mass begins. Next come two apostles: Peter with a key, and Paul with a sword, the symbol of his martyrdom. The other saints are represented in the lower section of the mosaic: the four greatest teachers of the Christian east, headed by Sts Cyril and Methodius and at the lower left four western teachers. 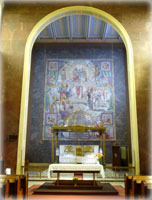 The whole mosaic is a picture of the heaven, at the bottom Archbishop Prečan is praying for his diocese, represented by the churches of Olomouc. The inscription is: “Let all nations praise the Lord.” In the corners are pictured the four evangelists with their symbols. The main idea of the church is expressed by the inscription in the lower part of the mosaic: “King of ages, immortal, invisible, the only God, honor and glory for ever and ever. Amen. It consists of a body made partly of marble (steps, mensa, tabernacle), partly of brass (pillars and the dome), in front of the mosaic. 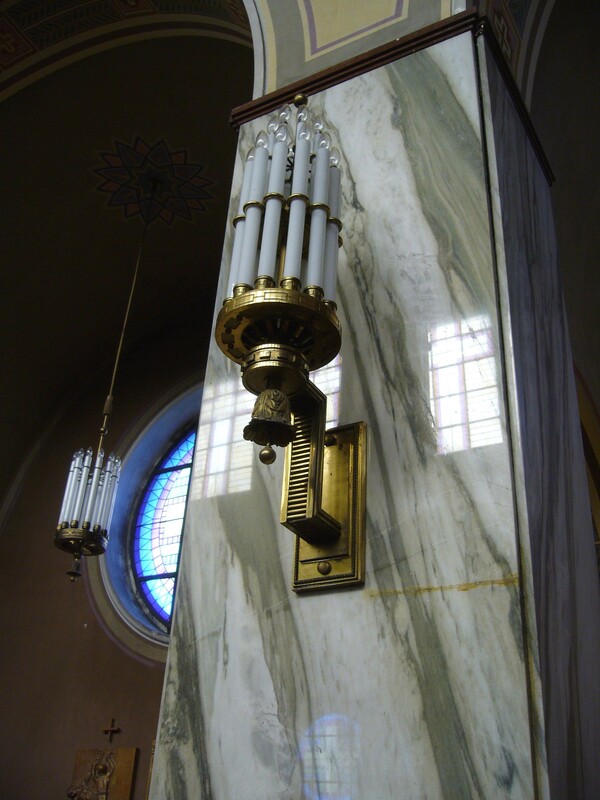 The steps and the mensa are of white marble (Gallacatta Giallo), the tabernacle is of African onyx. On the gilt door of the tabernacle are the symbols of Christ the Saviour, on the sides are two candlesticks, while the back section is decorated with reliefs of kneeling angels. The altars are situated symmetrically in the aisles. Made of various kinds of marble, the altar pillars are of Morocco onyx, the rings decorating them are of Carrara marble. The back part of the altar is of Cuban marble. The background consists of a blue mosaic – the picture of the sky. 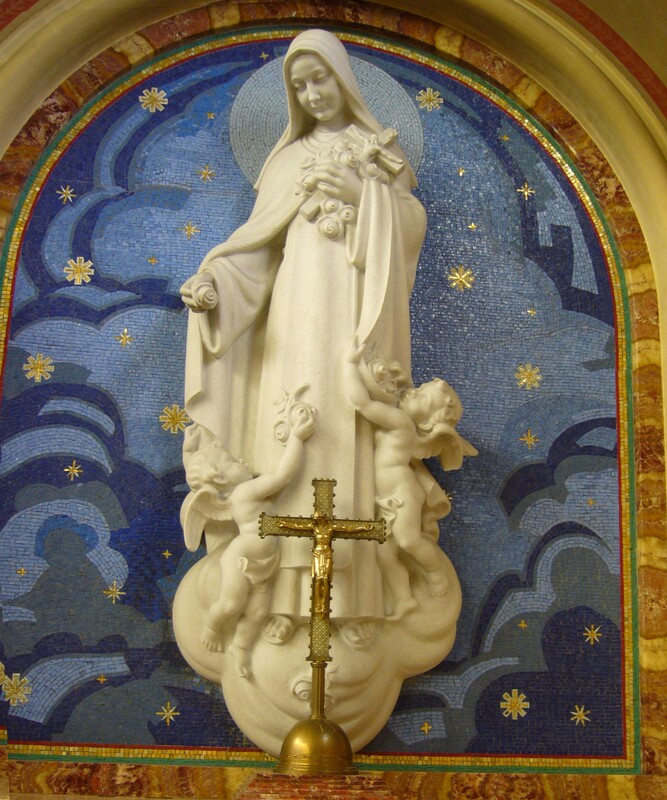 The statues on the altars are of white Carrara marble: St Agnes of Bohemia holds a model of the church, St Theresa is strewing roses – the graces which she promises to ask from God. 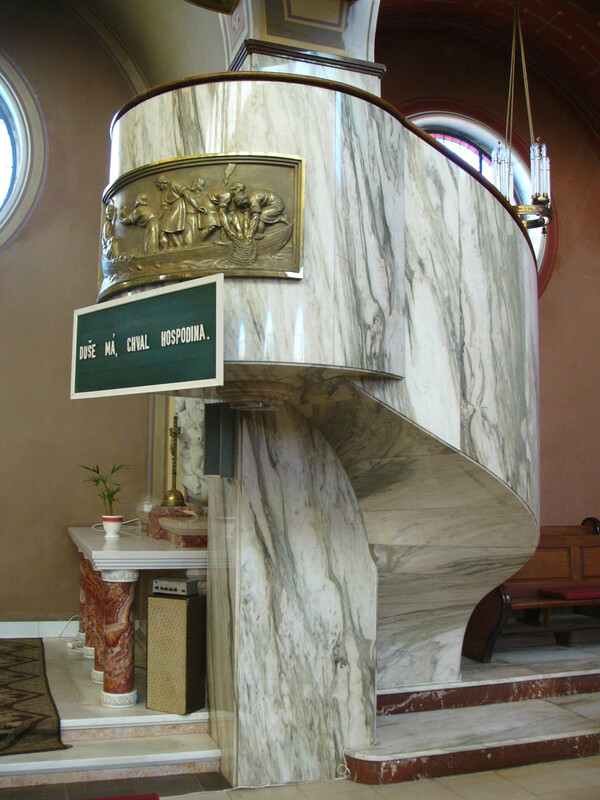 The pulpit’s facing is of marble, the staircase leading to the pulpit forms an arch. 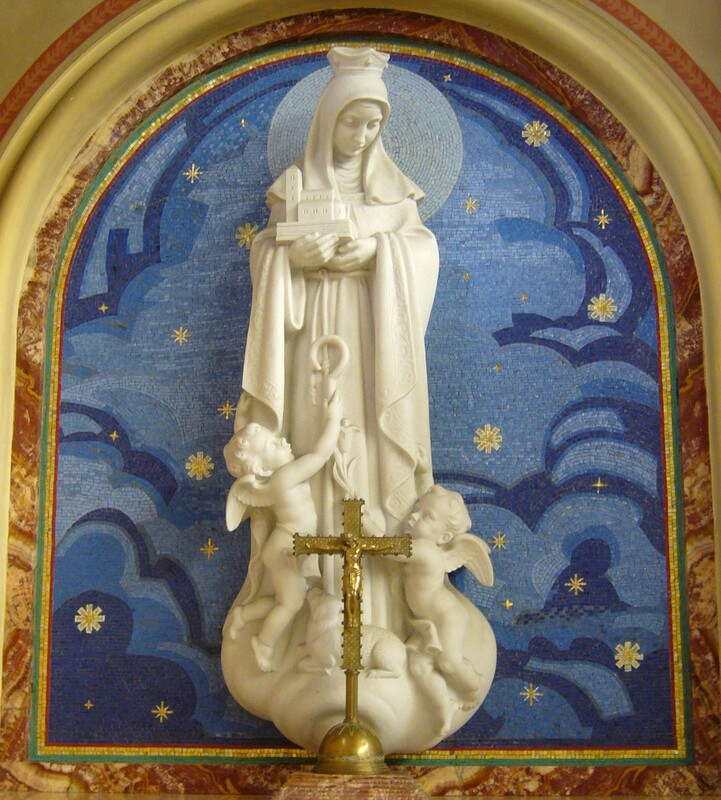 The fount (see the picture postcard) is placed behind the pulpit and is made of a single piece of Belgian marble. 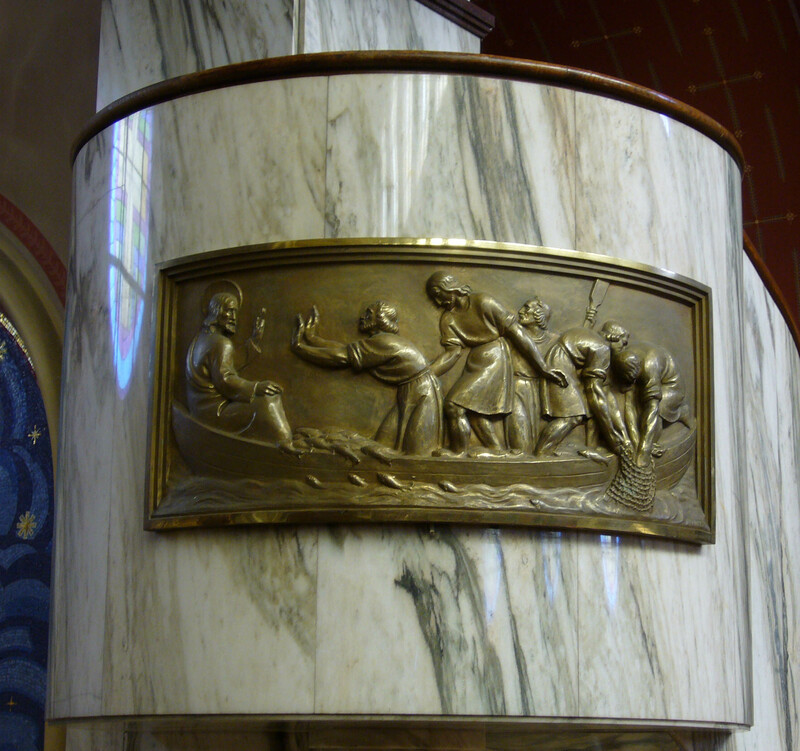 It is decorated with a brass relief. The entrance is on the right from the high altar. The chapel is a square 9 x 89m, the height is 8.70m. 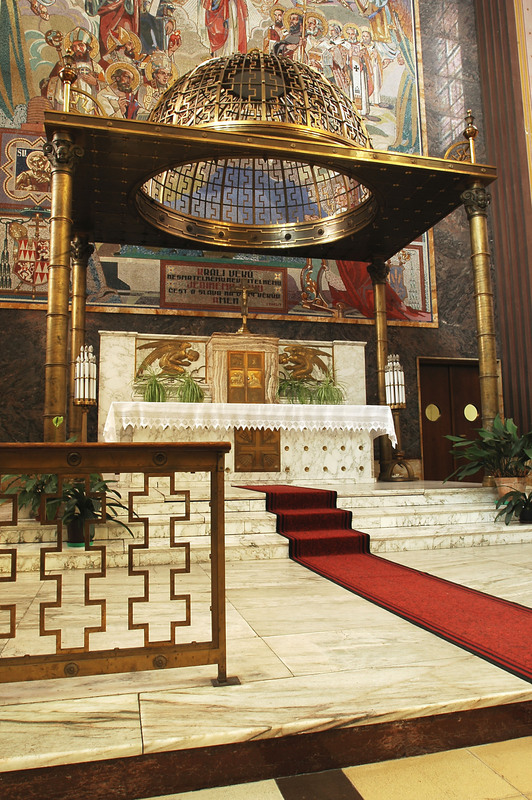 In its center is an altar from red Belgian marble, the tabernacle is made of golden Slovak onyx. 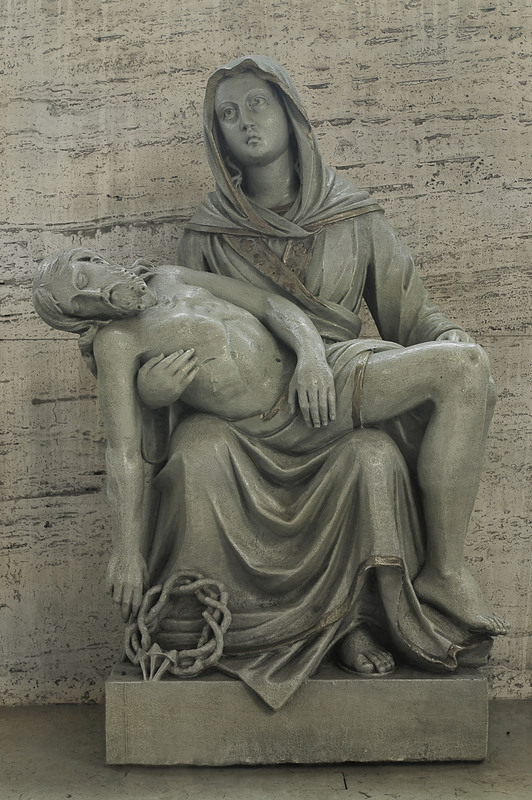 On the altar is a statue of the Virgin and the Child – patinated wood carving (by Julius Pelikán). The facing of the chapel is of white marble. 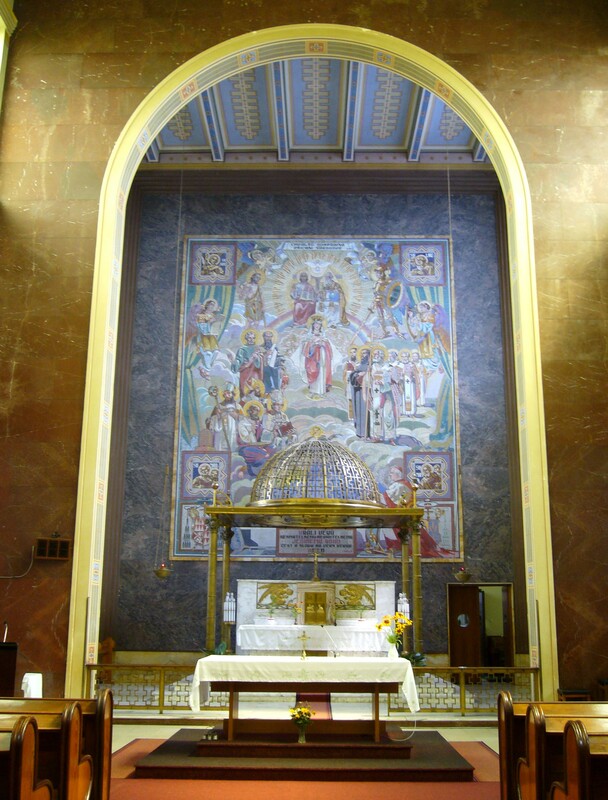 The painting on the glass behind the altar is by Jano Köhler (1934). It is interesting that in addition to the saints St Joseph, St Wenceslas and St Ludmila, also present are Blessed Zdislava of Lemberk and Blessed Jan Sarkander – they were canonized by Pope John Paul II in our parish. On 21 May 1995, on the Olomouc airfield, the Pope canonized Jan Sarkander, the martyr of the confessional secret, and Zdislava of Lemberk, the benefactor of the church and the people, a tertiary of the Dominican Order. This act was witnessed by an audience of thousands. On the sarcophagus are a reclining bronze figure - the Archbishop, and a praying cherub. On the front part of the sarcophagus are his signs: the emblem of the archdiocese and his personal emblem – St Wenceslas and three wheat oars, a reminder of his native region, Haná. On the long sides, in golden letters, are written the data of his life.